The City of West Hollywood is exploring several options for reducing the cost to landlords of retrofitting their apartment buildings to protect them from earthquakes. 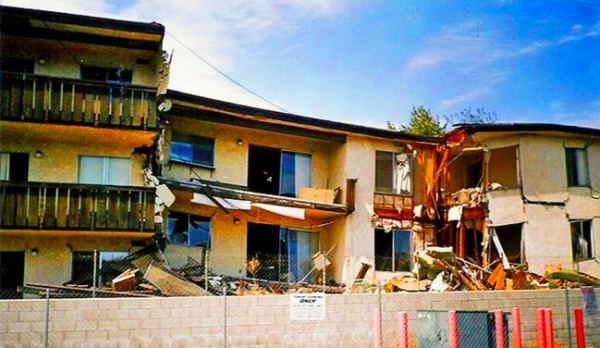 Degenkolb Engineers, a consultant hired by the city, has identified 705 residential buildings in West Hollywood that appear to be vulnerable to significant damage from an earthquake. Last year the City Council voted to require the owners of those buildings to have them inspected to determine if they were at risk, and if so to fix them. It also decided not to allow landlords of rent-stabilized buildings to pass the cost of retrofits directly along to their tenants. That left some worrying that owners of rent-stabilized buildings, confronted with the cost of retrofitting them, would sell them off to developers who could convert them into condos or demolish them and build new buildings, thus removing them from rent-stabilization control. The options the city is considering include securing funding from the Federal Emergency Management Agency (FEMA) to help pay for retrofits, reducing the fees that the city charges for building permits and changing the formula that owners of rent-stabilized buildings can use to justify an increase in rent beyond the percentage permitted by the city each year. According to a report to the City Council from the city’s Planning & Development Services Department, the city is applying for a $5 million grant from a FEMA program that is intended to help communities implement measures to reduce the risk of loss of life and property from future disasters. The city would use that money to offer rebates of design and construction costs to owners of what are called “soft story” apartment buildings, of which there are an estimated 688 in West Hollywood. A soft-story building is multi-story building with an open space where a wall would normally be required for stability in the event of an earthquake. Buildings with second-floor apartments above open parking space are examples of that. If the application is successful, the city would have to pay a quarter of that grant, or $1.25 million. The city also has submitted an application to FEMA for a grant of $10 million that would apply to all at-risk types of buildings covered by the city’s mandatory seismic retrofit ordinnce.. The city also is partnering with the California Earthquake Authority and other cities to apply for a $10 million FEMA grant that would help financially challenged owners of soft story buildings of five to 10 units. Eligible buildings would be those covered by rent-stabilization or whose landlords accept payments from Section 8, the federal rent subsidy program. If successful, the city will not have to pay a share of the cost and landlords can use the grant money to cover their plan check and permit costs. Degenkolb Engineers has estimated that the majority of soft-story buildings in West Hollywood will have a retrofit cost between $40,000 and $160,000 with some of the more complicated ones falling outside the range. That would amount to between $8 and $17 per square foot. Retrofitting concrete and steel-framed buildings would likely cost more, with an estimate of $50 to $100 per square foot. The City Council will be asked on Monday to approve a 25% reduction in building permit fees paid by property owners seeking city approval of their retrofit plans. Permit fees cover the cost of inspecting the projects to ensure they comply with state building codes and approved construction plans. A permit fee for a project costing $35,000 would cost the building owner $835.60 and the plan check fee would be $710.26. Those fees cover the cost of both city employees and outside contractors engaged to speed up the process. The City Council also will be asked to approve a change in the formula that landlords of rent-stabilized buildings can use to justify increasing rents by greater than what the current annual formula allows. The annual allowable rent increase is calculated as 75% of the increase in the Consumer Price Index for the greater Los Angeles region, which is determined by the federal Department of Labor’s Bureau of Statistics. In September 2018 that meant an increase of 3%, the highest in recent years. However, a landlord can ask for a larger increase if he can prove that his or her net operating income, calculated as the total rent received minus the cost of operating the building, is not greater than 60% of the amount by which the Consumer Price Index has increased since 1983. No building owners have applied for such an increase in the past five years. The city currently waives the fee for filing for such an increase for landlords whose expenses have increased because of reducing the risk of earthquake hazards to concrete apartment buildings. The fee is $500 plus $25 to $35 per unit, depending on the size of the building. On Monday it will be asked by the city’s Administrative Services and Human Services & Rent Stabilization departments to apply the fee waiver to all buildings at risk of earthquake damage and to change the base year for calculating net income from 1983 to 1999. The City Council will meet at 6:30 p.m. Monday at the City Council Chambers, 625 N. San Vicente Blvd., south of Santa Monica. Parking is free in the five-story structure behind the Chambers with a ticket validated in the lobby.